I am not sure why, but I seem to dodge alot more spit on the sidewalk in Chicago than I did in DC. Do people hock it up more in the midwest, I wonder? Laws, or at least good manners, date back to early last century. 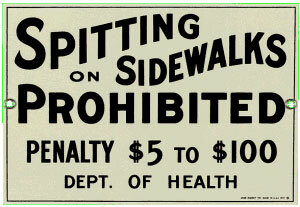 Here is an interesting story about a doctor, so worried about tuberculosis patients expectorating in public places, that he had the words "Don't Spit On The Sidewalk" engraved in bricks that were placed in sidewalks in a town in Kansas. • Kites may not be flown within the city limits. • It is illegal to fish in pajamas. • People who are diseased, maimed, mutilated, or "otherwise an unsightly or disgusting object" are banned from going out in public. • It is illegal for anyone to give lighted cigars to dogs, cats, and other domesticated animal kept as pets. • It is illegal to give a dog whiskey. • It is legal to protest naked in front of city hall as long as you are under seventeen years of age and have legal permits. • It is unlawful to change clothes in an automobile with the curtains drawn, except in case of fire. • The English language is not to be spoken. • You may be arrested for vagrancy if you do not have at least one dollar bill on your person. • You may be convicted of a Class 4 felony offense, punishable by up to three years in state prison, for the crime of "eavesdropping" on your own conversation. • You must contact the police before entering the city in an automobile. Hey DOP - off topic but I was watching the Golden Girls this morning and thought of you! Who is your favorite character...I'm more like Dorothy, but look more like Sophia stature wise. I imagine you to be a Blanche. and there's even a technical name in legalese for it: "statutory neglect" -the paralegal nerd.